The new research, led by scientists at Woods Hole Oceanographic Institution (WHOI), shows that ocean acidification particularly impedes the thickening process—decreasing the skeletons’ density and leaving them more vulnerable to breaking. The study was published today (Jan. 29, 2018) in the Proceedings of the National Academy of Sciences. “Our research incorporates the nuances of coral skeletal growth, enabling more precise projections of how, where, and by how much, ocean acidification will affect tropical reef-building corals,” said Nathaniel Mollica, who is lead author of the study and a graduate student in the MIT-WHOI Joint Program in Oceanography. The research team also included Weifu Guo, Anne Cohen, and Andrew Solow (WHOI), Kuo-Fang Huang (Academia Sinica in Taiwan), and Hannah Donald and Gavin Foster (University of Southampton in England). The research team developed a numerical model simulating this detailed skeletal growth mechanism and coupled it with projected changes in ocean pH (a measure of its acidity) induced by global climate change. The results showed that declines in coral skeletal density will occur on many coral reefs. The impact will be especially strong in the Indo-Pacific region, with up to 20 percent reductions in the densities of coral skeletons by 2100 in parts of the Coral Triangle—the area bounded by the waters of Indonesia, Malaysia, the Philippines, Papua New Guinea, Timor Leste, and the Solomon Islands. Corals in the Caribbean, Hawaii and northern Red Sea could fare better, the authors say, with declines of less than 10 percent caused by ocean acidification alone. “This very important study determined the specific way a coral species is affected by ocean acidification and modelled the effect of future environmental conditions,” said David Garrison, director of the National Science Foundation’s Biological Oceanography program, which funded a major part of the research, together with The Robertson Foundation and Woods Hole Oceanographic Institution. Coral skeletons are made of aragonite, a form of calcium carbonate. Corals grow their skeletons upward by stacking bundles of aragonite crystals, one on top of the other. At the same time, they thicken those bundles with additional crystals, which strengthens the skeletons and helps them withstand breakage caused by currents, waves, storms, and boring and biting by worms, molluscs, and parrotfish. “Coral reefs are among the most diverse ecosystems on Earth, with enormous cultural, ecological, and economic value,” said Anne Cohen, a scientist at WHOI and co-author of the study. Reefs face multiple stresses, including rising sea levels, changing nutrient regimes, and warmer ocean temperatures, she said, but unlike ocean warming, which causes visible bleaching, the impact of ocean acidification is more insidious and difficult to detect, and thus harder to predict. Ocean acidification is caused by rising levels of carbon dioxide in the atmosphere, mostly from burning fossil fuels. The carbon dioxide (CO2) is absorbed by seawater, setting in motion chemical reactions that produce bicarbonate (HCO3–) and carbonate (CO32-) ions. Coral polyps—the tiny living soft-bodied coral animals—bring in seawater containing HCO3–, CO32- and calcium (Ca2+) ions into a “calcifying space” between its cells and the surface of the existing skeleton. 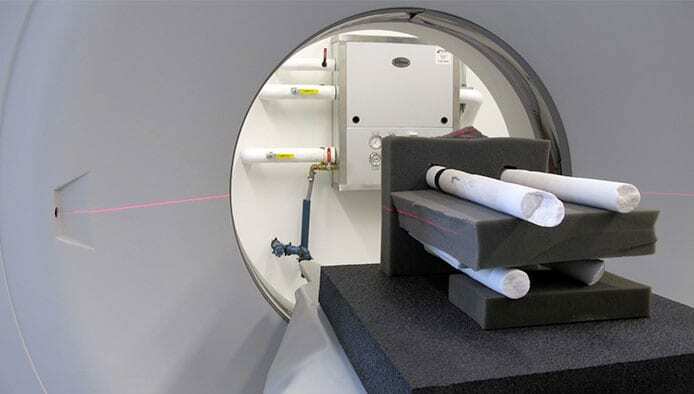 They pump hydrogen ions (H+) out of this space to produce more carbonate ions (CO32-) ions, making it easier to make calcium carbonate (CaCO3) for their skeletons. But when the oceans absorb excess CO2, as is happening now, there are more HCO3– ions but fewer CO32- ions in seawater, making it harder for corals to accrete skeletons. Laboratory experiments and field studies, however, have been ambiguous, showing clear negative impacts of ocean acidification on skeletal growth in some cases, but not in others. The new research suggests this inconsistency reflects in part the new-found complexity of coral skeletal growth. 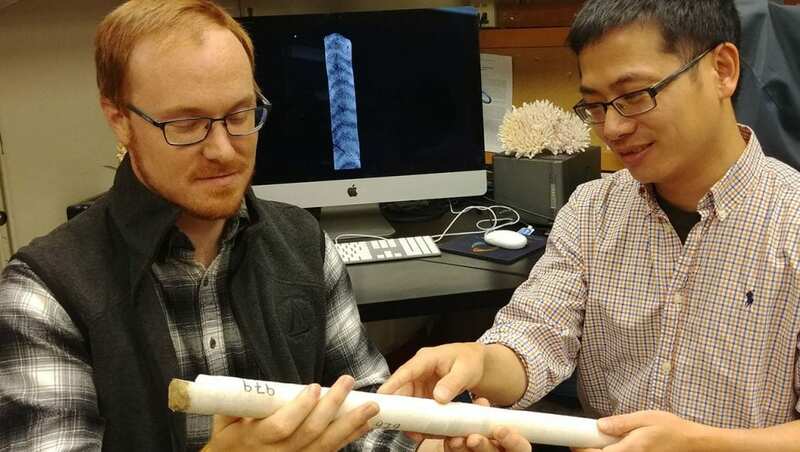 To test this theory, the scientists took cores of skeletons from a common type of reef-building corals called Porites in four locations: Palau, Dongsha Atoll in the South China Sea, Green Island off Taiwan, and Saboga in Panama, where seawater conditions spanned a wide range of pH levels and carbonate ion concentrations. 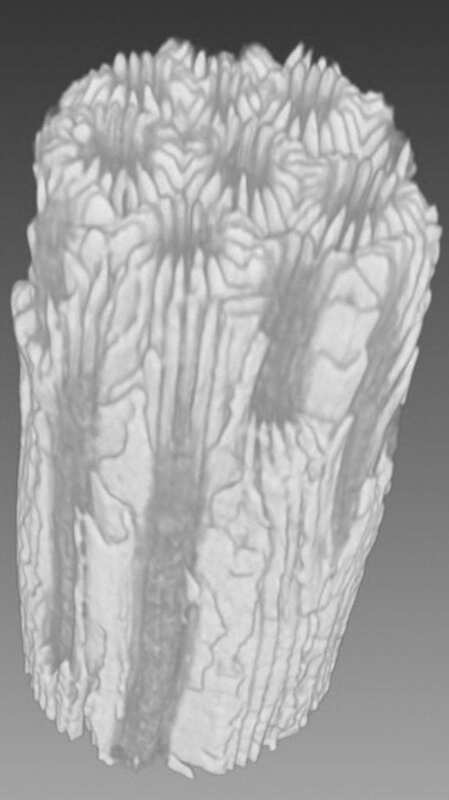 They used a 3-D Computerized Tomography (CT) scanner to image the skeletal cores, which reveal annual growth bands, much like rings on a tree. From the scans, they were able to discern and separately quantify the upward and thickening components of the coral growth. Their analysis revealed a consistent correlation: The skeletons of corals in more acidic (lower pH and fewer carbonate ions) waters were significantly thinner. However, they found no relationship between upward growth and carbonate ion concentration. 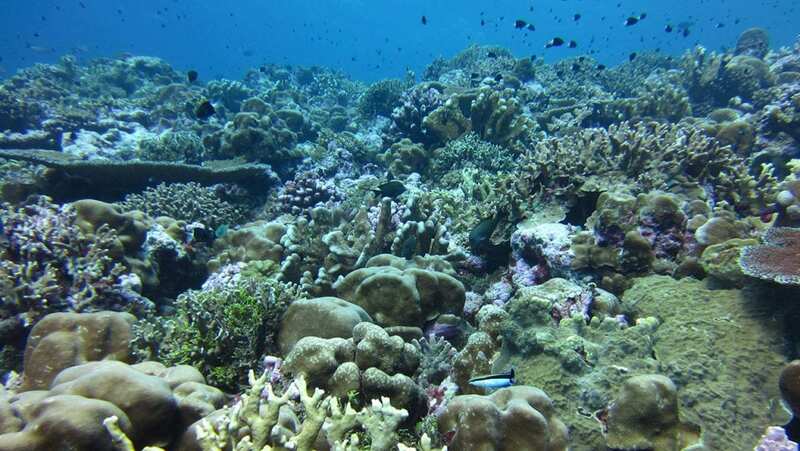 To better understand these processes, the researchers examined the coral growth process and showed that as pH and carbonate ions decline in ambient seawater, so do concentrations of carbonate ions in the corals’ calcifying space. Consequently, the corals can’t produce as much aragonite to thicken the skeleton. The corals continue to invest in upward growth, but “densification” or thickening suffers. As a result, corals in lower pH waters build thinner skeletons that are more susceptible to damage from pounding waves or attacks by eroding organisms. 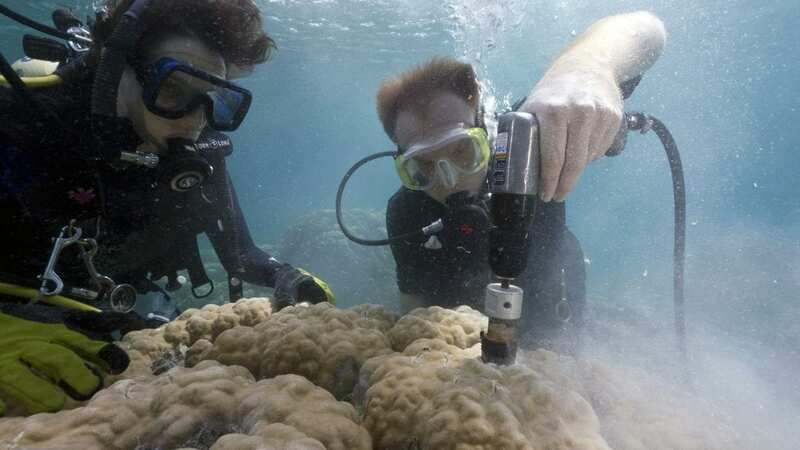 The research team further analyzed published data on more than 100 Porites coral skeletal cores taken by other scientists in many locations where the ambient seawater chemistry is also known. The analyses validated the team’s proposed mechanism of how seawater chemistry affects the density of coral skeletons. The researchers note that ocean acidification is not happening in isolation and that other changes such as ocean warming will also affect coral growth.